Today we are celebrating the Epiphany, Christ’s baptism by John the Baptist (Eastern churches) and the day on which Les Rois Mages (the Magi), the three kings Gaspard, Balthazar and Melchior came to pay their tribute to the world famous baby born Jesus (Western churches). La Galette des rois is a typical french tradition celebrated on the Epiphany, the tradition is to discover who will be the king or the queen for a day by having “la fève” hidden in the galette, historically a dry fava bean (hence the name) but now it became a little porcelain figure. The ritual says; the youngest child of the family hides under the table, an adult divides the galette in even slices, and the child decides which slice goes to whom. 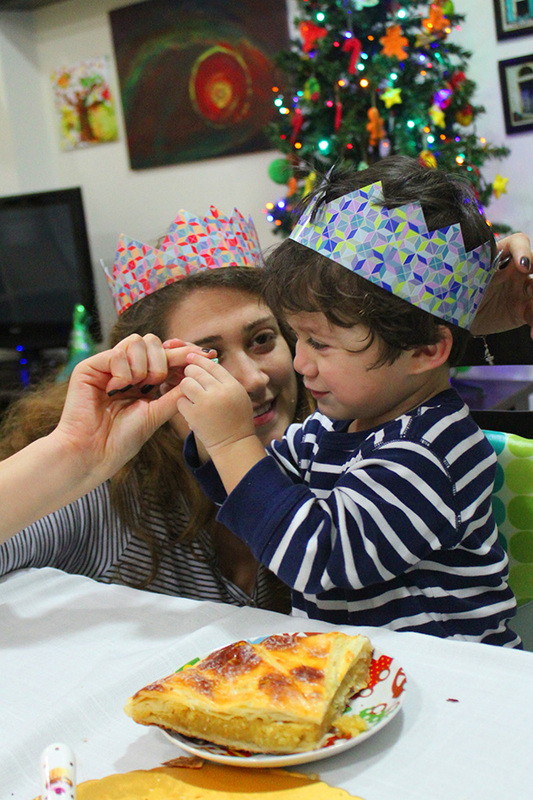 Whoever gets the fève in his serving is named King (or Queen) for the day, gets to wear the paper crown and picks who the Queen (or King) will be. 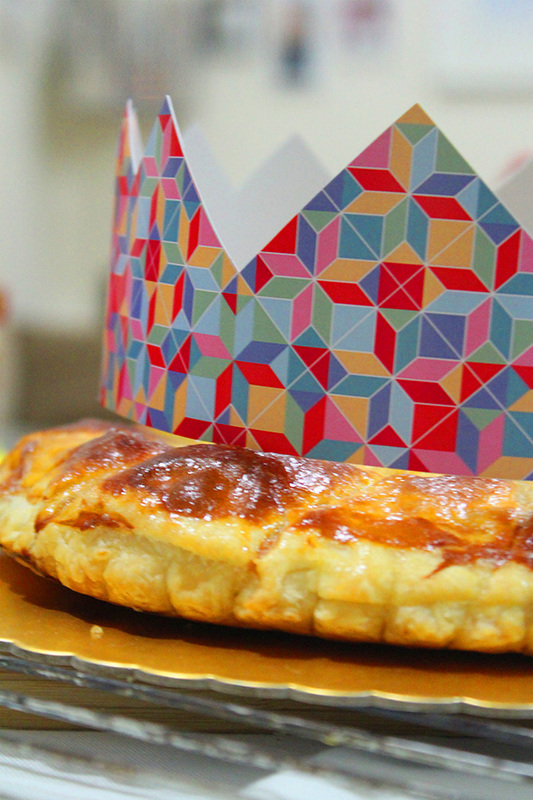 La Galette des rois is a traditional confection consisted of puff pastry pie garnished with butter with infinite options of stuffing. Today’s recipe is the galette à la frangipane et chocolat which is a blend of crème d’amande and crème pâtissière (pastry cream) and chocolate. With kids, chocolate is always a winning option! 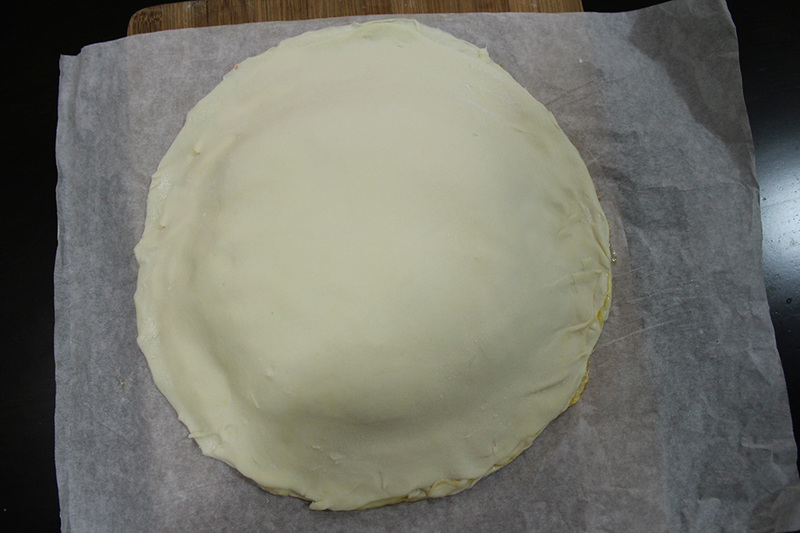 500g puff pastry (thawed if frozen), divided and rolled out to 2 circles, one is slightly bigger than the other (30cm diameter). Beat the butter until creamy. In a bowl combine sugar and almond flour. Add the butter to it and mix until smooth. Stir in the liquor and eggs one at a time and mix well at each addition. Add the crème pâtissière and finally the chocolate. 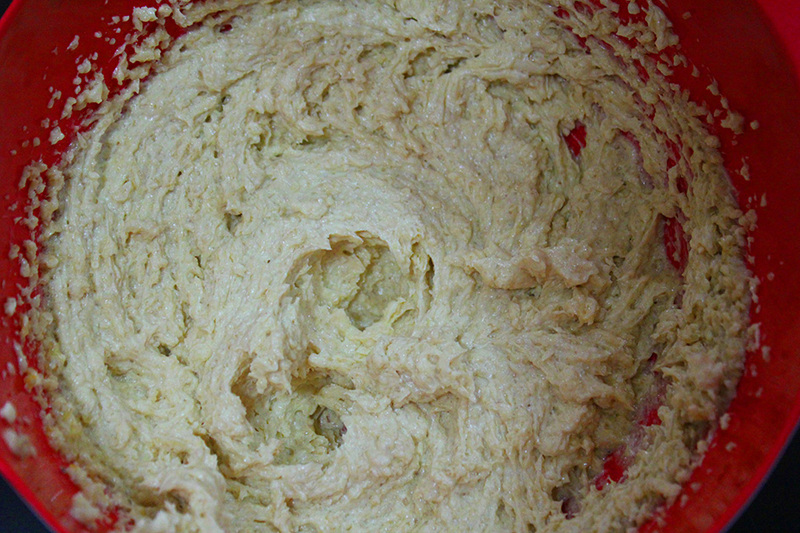 Lay the second round of dough precisely on top of the first, smooth it out gently over the crème to remove any air pocket, and press it down all around the sides to seal. 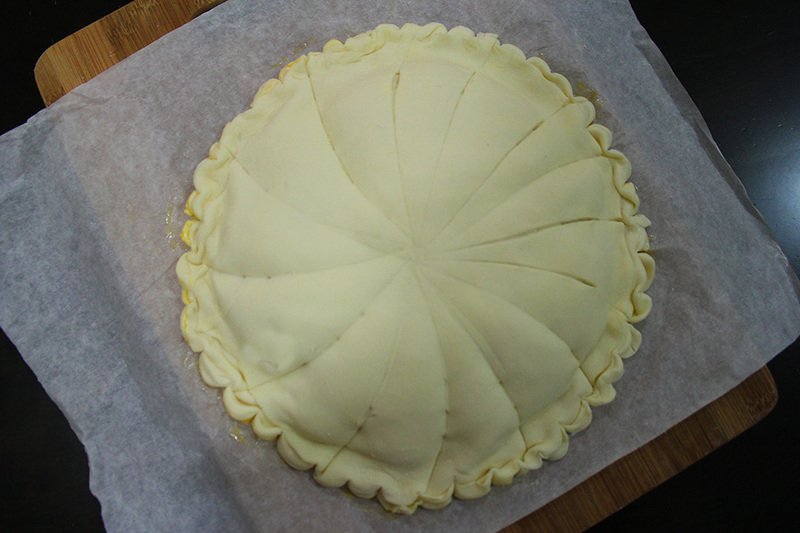 Using the back of the tip of your knife, draw a decorative pattern on top of the galette. Holding your knife upright, blade down, and using the dull side of the blade, push the dough inward to create a festooned pattern. 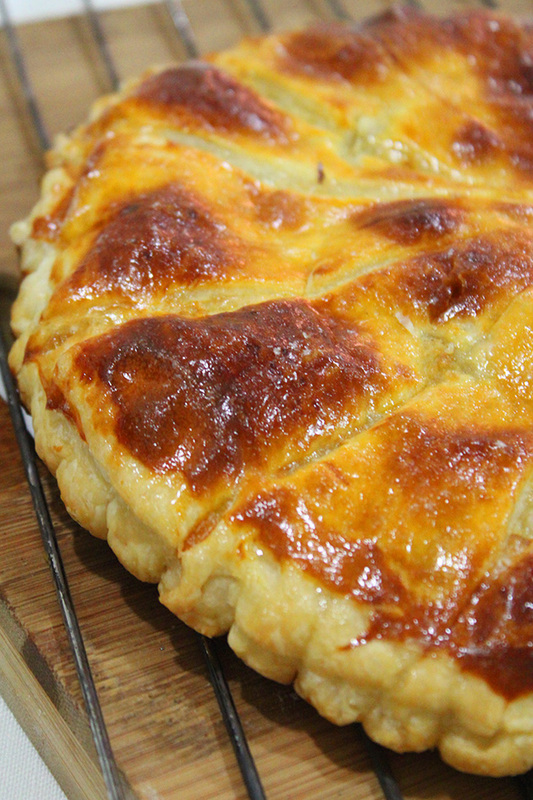 Brush the top of the galette lightly with egg wash: Make sure it doesn’t drip over the edges, or the eggwash will seal the layers of the puff pastry and it won’t rise. Let it rest a minute then brush it lightly again with the eggwash. 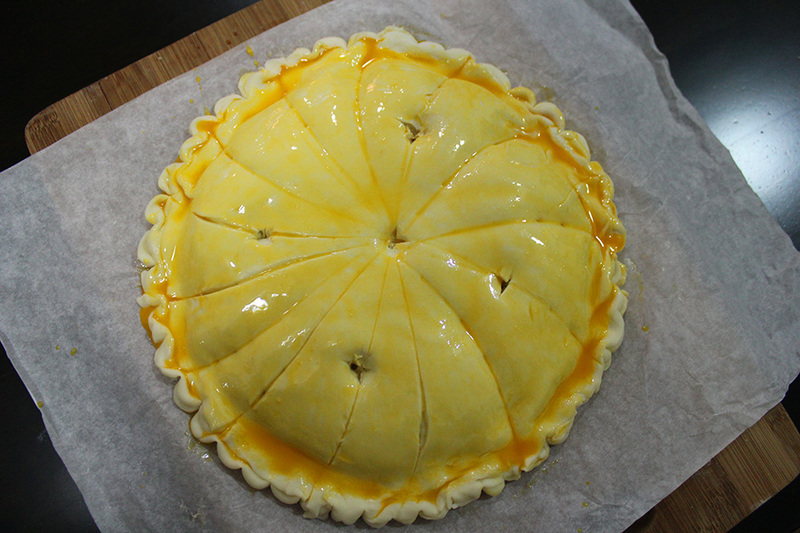 Using the tip of your knife, pierce the top dough through the pattern you’ve drawn to ensure an even rise. Transfer to a baking pan and bake for 30 minutes on 180°C and until puffy and golden brown. Let it cool to room temperature before serving. If you really like this post give it many likes and shares to spread the joy. Don’t forget to like marmite et ponpon facebook page and follow on twitter. More festive posts are yet to come. 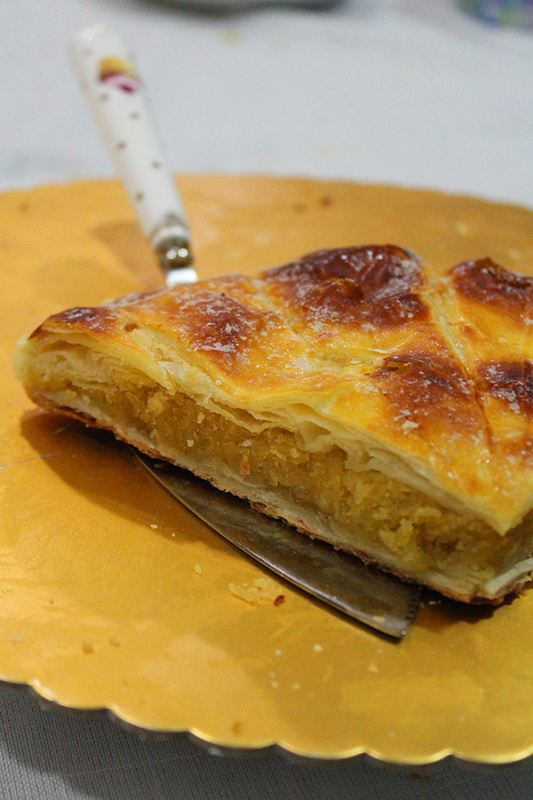 La Galette des rois à la crème d’amande, a traditional confection consisted of puff pastry pie garnished with butter. Today’s recipe has a stuffing of crème d’amande and not frangipane. There is a difference between the two: crème d’amande (almond cream) is a mix of butter, sugar, ground almonds, and eggs. Frangipane is a blend of crème d’amande and crème pâtissière (pastry cream). 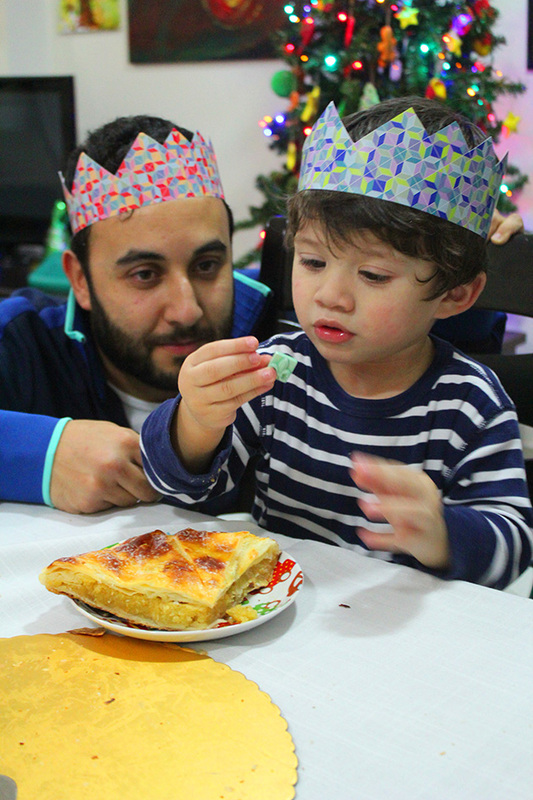 La Galette des rois is a typical french tradition celebrated on the Epiphany, january 6, the day on which Les Rois Mages (the Magi), the three kings Gaspard, Balthazar and Melchior came to pay their tribute to the world famous baby born Jesus. The fun about this tradition is to discover who will be the king or the queen for a day by having “la fève” hidden in the galette, historically a dry fava bean (hence the name) but now it became a little porcelain figure. The ritual says; the youngest child of the family hides under the table, an adult divides the galette in even slices, and the child decides which slice goes to whom. 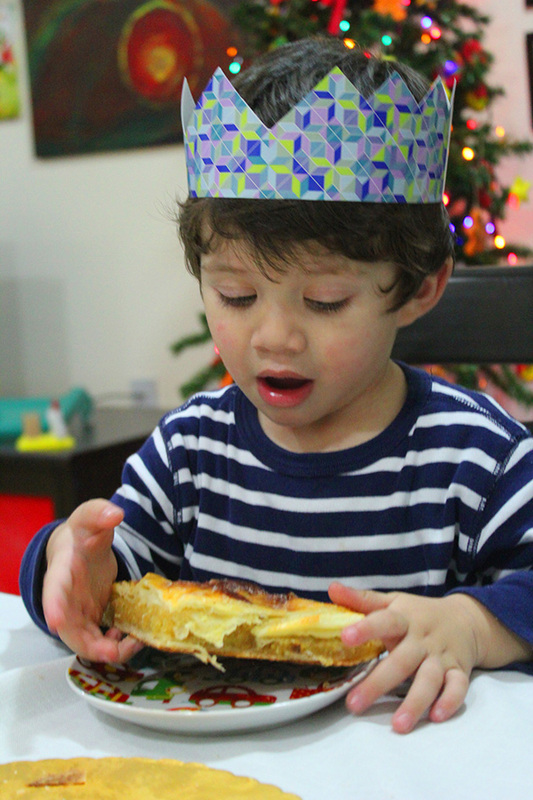 Whoever gets the fève in his serving is named King (or Queen) for the day, gets to wear the paper crown and picks who the Queen (or King) will be. Last year i was the queen, i got the fève. 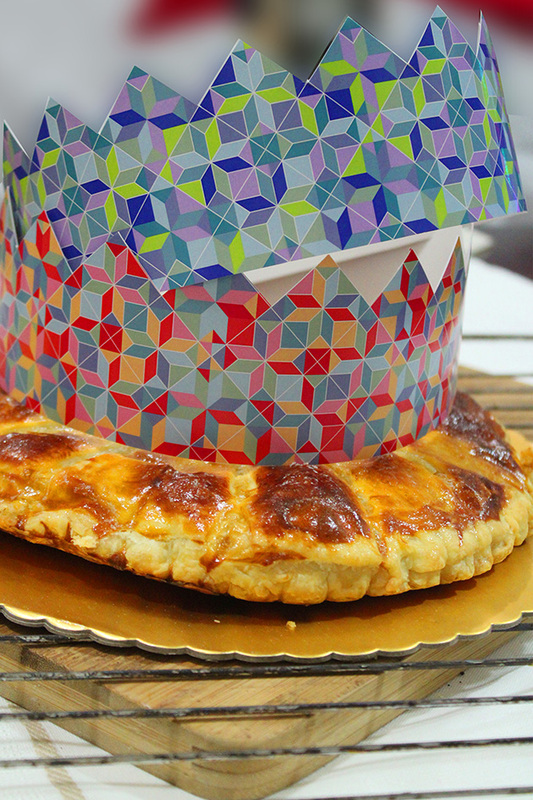 I kept it to use it this year in the galette as a good luck! Beat the butter until creamy. In a bowl combine sugar, almond flour, cornstarch and salt. Add the creamy butter to it and mix until smooth. Add the almond extract, liquor and then the eggs one at a time and mix well at each addition. Refrigerate for an hour or overnight if you are willing to bake the next day. Place the smaller of the two circles on a piece of parchment paper. In a small bowl, combine the egg yolk with a tablespoon water until smooth. 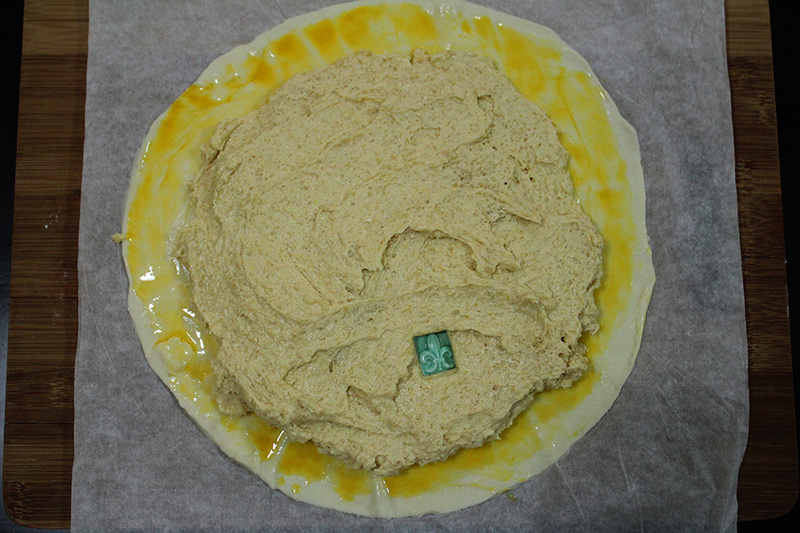 Using a pastry brush, brush the outer rim of the dough with it by a width of about 2.5 cm (1 inch). Make sure not to wet the actual edge of the dough, or it will impede its rise. Pour the crème d’amande in the center and spread it inside the eggwash ring. Place a porcelain trinket of your choice in the crème d’amande, not in the center but closer to an edge, or your knife will keep running into it when you divide the galette. Press it down gently to bury it. Lay the second round of dough precisely on top of the first, smooth it out gently over the crème d’amande to remove any air pocket, and press it down all around the sides to seal. 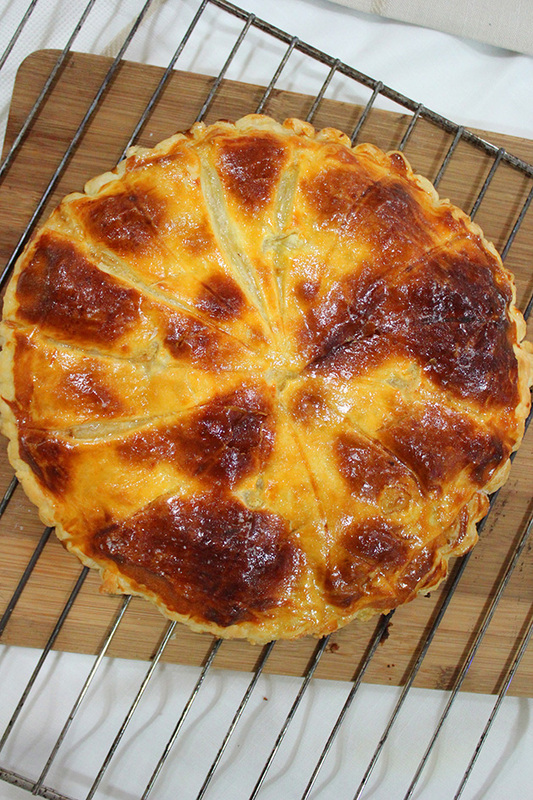 Using the back of the tip of your knife, draw a decorative pattern on top of the galette. I did a sun shaped pattern. Holding your knife upright, blade down, and using the dull side of the blade, push the dough inward where each sun ray ends, to create a festooned pattern. Brush the top of the galette lightly with the eggwash: again, make sure it doesn’t drip over the edges, or the eggwash will seal the layers of the puff pastry and it won’t rise. Let it rest a minute then brush it lightly again with the eggwash. Using the tip of your knife, pierce 5 holes in the top dough (one in the center, and four around the sides, piercing through the pattern you’ve drawn) to ensure an even rise. Transfer to a baking pan and refrigerate for 1 hour. Preheat the oven to 180°C and bake for 30 minutes until puffy and golden brown. Combine the tablespoon of confectioner’s sugar with a tablespoon of very hot water. When the galette is done, remove it from the oven, brush the top with the syrup, and return it to the oven for a minute; this will give it a shiny finish. Transfer to a wire rack and let it cool to room temperature before the fun begins!